The holder of the Hidesign Instant E- Gift Voucher (GV) / Gift Card number is deemed to be the beneficiary. Beneficiary should announce the intent of using the Hidesign Instant E- Gift Voucher (GV) / Gift Card before making a purchase. Only valid Hidesign Instant E- Gift Voucher (GV) / Gift Card number along with the PIN shall at the sole discretion of Hidesign shall be accepted for redemption. 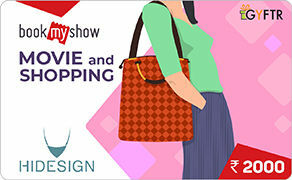 This Hidesign Instant E- Gift Voucher (GV) / Gift Card can be redeemed across all exclusive Hidesign boutiques in India. Multiple Hidesign Instant E- Gift Voucher (GV) / Gift Card can be used against one bill. Partial redemption of the Hidesign Instant E- Gift Voucher (GV) / Gift Card number is allowed but no refund or credit note would be issued against a unused or partially used Hidesign Instant E- Gift Voucher (GV) / Gift Card. Hidesign Instant E- Gift Voucher (GV) / Gift Card cannot be revalidated once expired. Hidesign affiliates are not responsible on account of the beneficiary sharing the Hidesign Instant E- Gift Voucher (GV) / Gift Card number and the same getting redeemed on that account. Any dispute related to the Hidesign Instant E- Gift Voucher (GV) / Gift Card number should be referred to the issuing company and the decision of the issuing company shall be final. All terms and conditions of the Hidesign Instant E- Gift Voucher (GV) / Gift Card are subject to change at Hidesign's discretion. Hidesign Instant E- Gift Voucher (GV) / Gift Card can be redeemed for the face value as mentioned. Store Staff may ask for a valid govt. identity proof at the time of redeeming the Hidesign Instant E- Gift Voucher (GV) / Gift Card. Hidesign at its sole discretion may add or remove an outlet from the list without giving any prior notice. Hidesign makes full efforts to accept Hidesign Instant E- Gift Voucher (GV) / Gift Card, but on account of any technical / administrative reasons an outlet may refuse to accept the same. If a Hidesign Instant E- Gift Voucher (GV) / Gift Card gets blocked on account of technical issue, it would get enabled in 72 hours.